This is really Collette's post. This is her story. These are certainly her pictures (has anyone noticed that the number of photos on this blog has increased dramatically since Collette got her D-80?) and I tried to encourage her to write this but ... well, my name pops up somewhere on this blog so here we go . 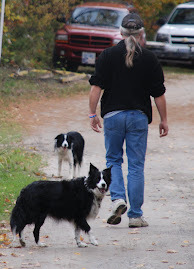 . .
Last weekend Collette went to visit her father, Nick, in the Parry Sound area. 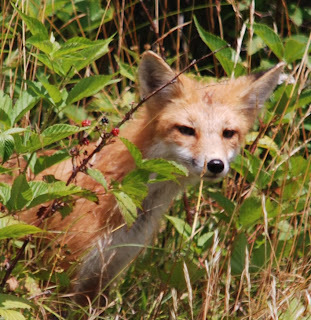 Nick's room mate, Fred, told her about a family of young foxes who had a den near a construction site he was working on. He graciously offered to take Collette out there so she packed up the Nikon and away they went. The house Fred is building is near the Shawanga reserve. He has been working on site for a couple of months when he had noticed three young foxes in a den. No mother seemed to be around. The foxes here are perhaps six months old. Over the time he has been working there, Fred had developed a kind of relationship with the foxes, mostly revolving around Italian sausage. 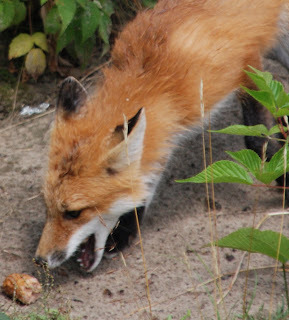 With that as a lure, he began coaxing the foxes out of their den. Here is the first fox being coaxed out of his den. He probably recognizes Fred, they were almost feeding from his hand at one point but now there is a stranger, and she has something in her hand but .. wait .. I smell sausage!
. . . but gosh .. it's sausage! .. back to the den with his prize. Then out came this guy, definitely a male fox Collette dubbed "Blackfeet" for obvious reasons. He made a beeline for the prize. He had a big appetite, Mr Blackfeet and was not shy about coming back for more ... are these Italian Canadian foxes? And there goes our black footed sausage connoisseur, fading into the sunset . . .
Wow, you are so amazingly fortunate, I would love, love love, to see a fox, I haven't my entire life. Of course, then I would want it to sit on my lap, but still, wow. Thanks, at least I can live out the dream vicariously.